A little bit of history..... can be traced back to when Mr Joseph Joynsons began manufacturing and repairing food weighing and slicing machinery way back in the early 1890's...... Little did he realise that the Joynsons name would still be serving the food industry 120 years later. Over this time the key elements to the Company's success have been the association with quality products and a service that is still as personal as the first day of business in 1892. 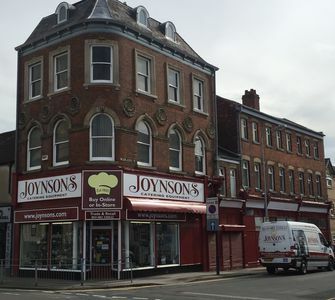 At Joynsons, we offer customers a vast array of catering equipment and sundries, ranging from everyday utensils to bespoke cad kitchen design as well as repairs and servicing thanks to our professional engineers. We serve the NHS, local authority councils and private companies plus many international blue chip organisations. We also supply the general public from our city centre showroom, conveniently located on Anlaby Road, opposite Hull's Paragon Interchange. Established in 1892 by Joseph Joynson as a manufacture and service agent for weighing and slicing machinery, Joynsons has evolved through six generations to offer one of the industry's largest product portfolios. For more information, just ask. Our team is here to help with all enquiries from 8.30 am to 5pm Monday to Friday. Please note, we are closed on weekends.